The map above shows the approximate path of a tornado believed to have touched down in Ennis. Officials with the city of Ennis released a map Thursday showing the approximate track of a tornado that touched down in the town Wednesday night. In the map, the tornado is plotted as moving from the southwest to the northeast, first touching down along Ennis Avenue west of Spur 437/Clay Street. 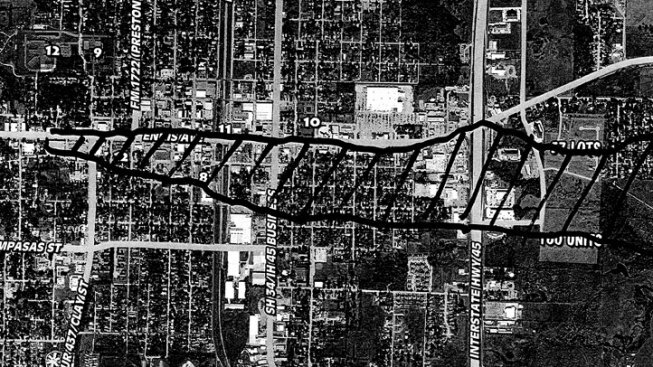 The tornado then moved along Ennis Avenue, on a northeasterly course, while spreading as far south of Ennis Avenue by as much as four blocks. The tornado eventually crossed Interstate 45 and headed northeast toward more open farm land. City officials said Thursday afternoon that damage estimates classified the tornado as an EF-1, with wind speeds between 86-110 mph. As many as 13 tornadoes are believed to have touched down in North Texas Wednesday night. One of those, which touched down in Granbury and killed six people, has been rated an EF-4 by the National Weather Service.